The ultimate bloggers' resource guide. Everything a blogger needs to start and maintain a website, get noticed, increase social engagement, start your brand and everything in between! I have tried many things and these are the tools that have worked for me. Remember a great blog doesn't happen overnight, it takes time and commitment on your part. You got this! Most of these are affiliate links. I only recommend things I have used and love. If you click and take action I may be paid a commision to help maintain She Who Honors. Thank you! The first thing you need to do is build a website. Weebly website builder is an easy way to make a quality website. No computer background needed! It has a unique drag and drop builder to create your unique and awesome websit.e I love and highly recommend it. This is an affiliate link. Weebly has proffessional themes, different plan pricing for your needs, an app center and be able easily manage your site on the go! Make Weebly website builder a must have for your blog website. I have found stock photos that I love! Pixistock by Alicia Powell. She has many beautiful stock photos in her collection. She has collections by niche, colors and seasons! You can sign up to get free stock photos every month or join her membership at various prices and have access to all her fabulous photos. Here's a lovely photo with my gold and black brand colors. Isn't it darling? I recommend Pixistock by Alicia Powell. These are tools that will help you with graphic designs and photo editing for blog photos, pins, tweets, facebook, IG, Linkedin and every other social media site out there. These are what grabs your readers and increases your social reach and engagement. Canva is a tool that can help you make beautiful designs for your blog, pins, tweets, documents, cards, brand... anything you need. I use it regularly for my blog post graphics and designing pins for pinterest. It helps you stand out in the crowd. There are pricing plans from free to paid. Crello is another graphic design tool very similar to Canva. Crello is a "free graphic design software and photo editor" (crello.com). What is unique about crello is it has animated posts available. I have used those a few times in my IG and FB posts. Great to use fro blog graphics, pin creations, social media graphics, etc. They have a free plan or a paid pro plan. Stencil is an image creation tool. "The fastest way to double your social engagement" is their slogan. It is really easy to use. I use Stencil and Canva the most. I have used it in my blog, pins and social media posts. Using neat graphics and photos are a great way to getting increase viewers, fans and followers. I see an increase when using unique designs and photos. Stencil offers a free plan with 10 free images a month or paid pro plan that offers many more images and an unlimited paid plan. This is an affiliate link. Another great tool is Visme. Visme is the "swiss knife" for creating engaging content. This one tool can be used for presentation, webpagedesign, social media graphics, e-books, printables and infographics. They offer live webinars to get you started on using the tool. There are different plans from free to $20/month. Logojoy is a must use to create and design a logo you love for your brand and/or company. They create logos using their logo generator. The logo generator gives you various options and designs for a logo. It even has mock ups of your logo on T-shirts, business card and documents so you can see how it will look. I used it to design my She Who Honors logo. I tried other logo designers and loved what Logojoy designed the most. This is highly recommended. This is an affiliate link. Set up social media accounts for your brand/blog. Engage with your followers/friends - like, retweet, comment, follow people and follow back. Don't stay silent. Only have as many accounts that you can manage or hire someone to manage your accounts. Remember everything you tweet/post/comment will be around for a long time - think before you post. Post things in your voice, brand, blog. Don't let likes, followers, friends define you, make you happy, be your identity. Use a social media scheduling/management tool. I use Buffer for my Twitter and Facebook posts. It is really easy to use. I add my content and pics for a post and can schedule it to post right away or anytime I choose. It saves me lots of time. Tailwind is one of the greatest inventions of all time! This is by far my favorite tool/app/ computer thing ever! 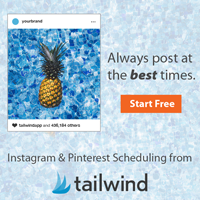 Tailwind is an official " Pinterest Marketing Developer and Instagram Developer Partner!" It offers smart scheduling for Pinterest and Instagram, analytics, hashtag suggestions, tribes and much more. When I started using this my Pinterest reach was in the thousands. I saw page viewer increase. A favorite thing is the Tribes. You join a tribe with similar interests, add your pins and repin others. We help others increase our reach. It is awesome! You can join a tribe and get a free month of Talwind plus! Tailwind helps you pin at the right times. You have to check it out for yourselves. There is so much to Tailwind I rather you check it for yourself. If you want your blog/brand to get exposure, Tailwind is what you need. This is an affiliate link. Email is a very important form of communication for your blog/website. It helps keep your followers connected and updated. It can help build your brand, blog and exposure. Email can be used for marketing campaigns,too. ​ Email automation makes it easy! I use MailChimp for my email automation. It is free to use if you have under 200 subscribers. I like Mailchimp but this little paragraph doesn't begin to tell you all the tools it has. Check out their website. Mailchimp. Affiliate marketing is the process of promoting others people's or businesses products and earning a commision. It involves sharing links, banners and pictures on your website and social media. I recommend you promote products you like and that is inline with your blog/website posts or pages. There are many affiliate marketing programs out there. I currently use ShareASale. ShareASale has thousands of merchants/businesses that you can choose to promote their products. It is easy to join a program; it takes around 2 days for approval. There are many bloggers/websites that can help you make money with affiliate marketing. But please be cautious of those who claim you can make tons of money, use discernment. Only a few percent makes lots of money. This is an affilialte link.